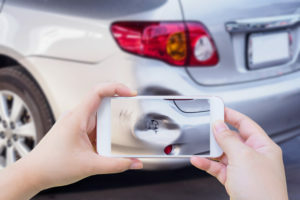 Photo estimates can produce a lower supplement rate if restricted to minor damage, OnSource client services Associate Vice President Leslie Redfield told a Collision Industry Electronic Commerce Association webinar Thursday. Redfield warned that its expansion to heavier damage might lead to a higher supplement rate and not accurately capture the extent of the severity, Adjusters and first notice of loss representatives need to be trained on when photo estimating is appropriate, and most insurers have “strict guidelines” for when to use the technique, she said. Unlike a competitor like Snapsheet, which produces photo estimating software and has a business writing estimates based off of such photos, OnSource typically just provides photo estimating software and support for companies that don’t want to set up that infrastructure themselves. The company facilitates the customer taking the photos and transmitting them back to the insurers, who “want to write those estimates themselves” about 95 percent of the time, according to Redfield. OnSource even supplies representatives who will go out and take photos themselves and staff to handle tech support for policyholders trying to use the software. “Every month, we do about 45,000 assignments,” she said. She noted, however, that the vehicles that qualified for this method of appraisal were “low-severity losses,” some of which “at the customer’s option” weren’t even repaired. Asked in an interview Friday if the lower supplement rate referenced excluded instances where the customer just took the money and failed to repair the car, Redfield said yes. “It’s really up to the insurance company, and it varies widely,” she said. Redfield implemented Safe Auto’s photo estimating process at Safe Auto prior to joining OnSource. A 2015 OnSource case study of SafeAuto reported that OnSource was used in 43 percent of repairable estimates, OnSource claims had a supplement rate of 20 percent a severity that held steady at $1,500 despite increased severity elsewhere in the insurance industry. Asked how carriers controlled for invisible but common SOP items like scanning a vehicle (odds are at least a post-scan is required), calibrating something, and measuring the vehicle, Redfield said in the few instances where OnSource managed the estimate, it would follow the dictates of the carrier. Besides stressing which type of damage should be photo-estimated and which shouldn’t, Redfield told the webinar it was “extremely important” that insurers review photo estimate accuracy. “This should be an ongoing process,” she said, and “most companies” have such a check in place. Asked Friday for more detail about auditing, Redfield said she used to run auditing at an insurer, and the company looked at a minimum of three estimates a month for every appraiser. “That gives you a really good sample,” she said. Quarterly, an additional batch of estimates would also be reviewed, she said. Redfield also recommended that a dedicated internal team of adjusters or dedicated team of independent appraisers be used to produce the photo estimates, rather than just adjusters or appraisers plucked at random. It’s a “little different” than standing before a vehicle, though not as much as you’d imagine, she said.